2006 saw the beginning of our attempts to increase the number of youth competing across the world, with the first Mattel World Youth Scrabble Championship in Wollongong, Australia. This year will be the 14th such event, albeit now renamed WESPA Youth Cup. Numbers of young players have been increasing exponentially, particularly in Asian countries, where there are now thousands of youngsters competing in Pakistan, Thailand, Sri Lanka, India, and Malaysia. Places like Hong Kong,Philippines, Singapore and Indonesia count their players in the hundreds. This year, we will be adding Japan youth to the fold, with aspirations to soon include Taiwan, China, Vietnam and Myanmar. After 13 years, we are seeing significant numbers of WYSC Alumni competing on the world stage. In Alchemist Cup, 11 of the 50 elite players had previously competed in WYSC. This flagship event will continue to induct and develop quality young players into the Scrabble scene. We encourage all countries to focus on getting their best youth to this event in 2019, when it will return to the central Asian hub of youth Scrabble (Malaysia), a country easily accessible to most, both financially and visa-wise. WESPA Youth Committee can assist with training and advice, including running tournaments, using tournament software, setting up ratings systems and websites. Help us build the future of Scrabble. The theme this year for Promotions is one of "growth" and covers three main areas: promoting awareness of the global Scrabble calendar, communication strategies (especially online and social media) and priority for video and photography. Throughout all of this, WESPA is here to support member Associations in their efforts to grow their sport locally through proper execution of the above areas of action. The WESPA Tournament page already features many events available for players who want to travel to play. We recently revealed there is still scope under the quota system for approximately 80 more events if all nations used their annual quota of allowable events. This page has been upgraded to show Event Organizers how easy it is to get their event on the calendar and who to refer to if there are any queries. A more full calendar provides for more players to stay involved which will grow our base to the levels it should be. To support this, getting the message out is paramount. WESPA's website is geared toward sharing and communication; further, there are three social media platforms that we use that can maintain promotion. Social media is changing, especially as the major players move to a "pay to play" model. It means we are more reliant on ourselves to share to our own networks. The WESPA Facebook Group has been established as a way of meeting this changing nature and we recommend people join and get involved. Our Facebook page still remains strong but is complemented by the group. Twitter has taken a back seat but is still used, though our Instagram page has been gaining in popularity. It means that there are more ways WESPA can support local Associations. But we cannot do it alone - and this is where the final aspect comes into play. The technology for quality video and photography has never been more convenient for people across the globe. And the Scrabble Community needs to get better at taking advantage of this. 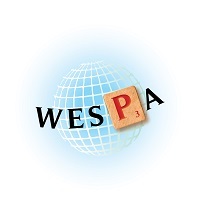 As soon as tournaments are completed, photos and/or video can be provided to WESPA Promotions to help distribute the outcome. As soon as something notable occurs, we can distribute it to more people than if it were simply shared into a closed group. That is not to say that that should not be done but by the very fact that WESPA's posts are public, the chance for reaching more people is real. Not only has the technology for producing the material improved, so too has the methods to send it. Phones have become powerful tools when used to their fullest, by way of example. WESPA stands committed to assist Associations get their messages out providing quality content is provided to us. We are looking forward to a big year for Scrabble, especially with WESPAC in October. Growth by promotion is possible - and we look forward to your support.